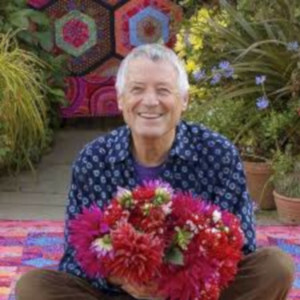 One of the world’s leading textile artists, Kaffe Fassett MBE is best known for his knitting, needlepoint and patchwork. He has dedicated his life to promoting these and other crafts, through his own work and by encouraging others. It was for this that he received his MBE, in 2018. After he collaborated with Missoni during the 1970’s, his unique garments were commissioned and collected by Barbra Streisand, Lauren Bacall and John Schlesinger, to name but a few. His knitwear designs helped make traditional textile handicrafts go mainstream in fashion. When he became the first living textile artist to have a one-man show at the Victoria & Albert Museum in London, he doubled the Museum’s attendance figures and went on to tour the exhibition in nine countries. He has been interviewed on TV and radio for many programmes including Richard and Judy’s This Morning; The Bazaar; Chelsea Flower Show Live, Collectors Lot, The Homes Show, Through the Keyhole, Woman’s Hour and Desert Island Discs. A prolific and bestselling author, he tours internationally giving workshops, lectures and museum exhibitions.